This article is about physical fetters used as restraints. For other uses, see Fetter (disambiguation). "In irons" redirects here. For the sailing term, see Point of sail § No-go zone. Legcuffs are physical restraints used on the ankles of a person to allow walking only with a restricted stride and to prevent running and effective physical resistance. Frequently used alternative terms are leg cuffs, (leg/ankle) shackles, footcuffs, fetters or leg irons. The term "fetter" shares a root with the word "foot". Shackles are typically used on prisoners and slaves. 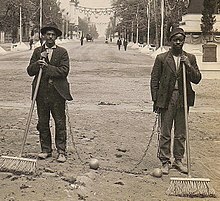 Leg shackles also are used for chain gangs to keep them together. Metaphorically, a fetter may be anything that restricts or restrains in any way, hence the word "unfettered". Roman times already see a variety of restraint types. Some early versions of cup lock shackles can already be found. These were widely used in medieval times but their use declined when mass production made the manufacture of locks built into restraints affordable. Simple fetter types continue to be used like puzzle lock shackles as the typical slave iron or irons riveted shut for prisoners being transported to overseas prison camps. The first built-in locks often were of a simple screw-type but soon developed into the "Darby" type. In Europe these continued to be used into the middle of the 20th century, whereas in the U.S. from the late 19th century onwards many new designs were invented and produced before handcuffs and leg irons of the Peerless type became the standard several decades ago. One type of shackle, called an "Oregon Boot" or "Gardner Shackle", was patented by Oregon State Penitentiary Warden J.C. Gardner in 1866. The shackle consisted of an iron band of varying weights that was locked around one of prisoners ankles that was supported by braces which went down and under the prisoners foot. The shackle's weight hobbled the prisoners movements to prevent escape and long term use would cause severe injury to the wearer. Use of this type of shackle was ended by the mid-20th century. In comparison to handcuffs the wearing of leg irons may be found less restrictive. Thus the prison authorities in several countries deem their long-term use acceptable. In order to avoid condoning this disputed practice, the countries of the European Union have banned exporting leg irons into non-EU countries. The countries that continue to make prisoners wear fetters long term now tend to manufacture their own restraints. ^ "Select Your Library - Credo Reference". ^ Chisholm, Hugh, ed. (1911). "Fetters and Handcuffs" . Encyclopædia Britannica. 10 (11th ed.). Cambridge University Press. p. 296. ^ Reynolds, Marylee. "Back on the Chain Gang". Corrections Today. Gale group. Archived from the original on May 21, 2011. Retrieved 1 October 2013. ^ "DOC Operations Division: Prison A Brief History of the Oregon Boot". www.oregon.gov. Retrieved 10 December 2017. This page was last edited on 24 March 2019, at 04:59 (UTC).